The paper, UKRAINE’S SECURITY OPTIONS: Time for Strategic Choices, Smart Partnerships, and Comprehensive Reforms, by Dr Hanna Shelest and Hennadiy Maksak, sets out the four strategic options now available to Ukraine – all of which have their advantages and disadvantages in the light of the existing threats to national security. Creation of a system of bilateral and multilateral security arrangements and alliances, mostly with neighbouring states or big powers to guarantee national security and capabilities for response to threats. • Ukraine should participate in joint maritime patrol and exercises activities with NATO members, and work with non-Black Sea member states’ navies to enhance the navy potential and skills of Ukraine and other Black Sea states. 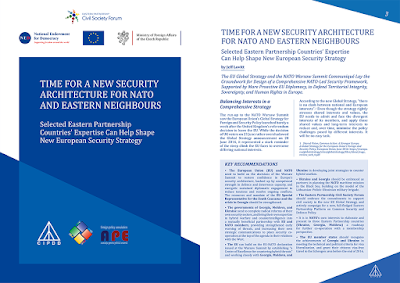 • Ukraine should adopt a National Information Security Strategy that incorporates the latest strategies adopted by NATO and the EU to enhance co-operation in the security sphere. • Ukraine has to demonstrate more leadership within the Eastern Partnership region, especially in shaping a joint agenda on security issues. • Reforms are needed to separate the overlapping of the General Staff and the MoD, and Ukraine should discuss the possibility of transferring the responsibility for the appointment of the Minister of Defence from the President to the Prime Minister – with the requirement of further approval by the Parliament. • The creation of an expert council under the National Security and Defence Council would allow both an increase in the level of expertise in the preparation of recommendations, and also serve as a mechanism for civilian control over the security sphere. 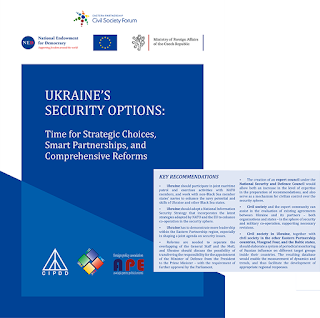 • Civil society and the expert community can assist in the evaluation of existing agreements between Ukraine and its partners – both organisations and states – in the sphere of security and military co-operation, supporting necessary revisions. • Civil society in Ukraine, together with civil society in the other Eastern Partnership countries, Visegrad Four, and the Baltic states, should elaborate a system of periodical monitoring of Russian influence on different target groups inside their countries. The resulting database would enable the measurement of dynamics and trends, and thus facilitate the development of appropriate regional responses. Dr Hanna Shelest is the Head of the Board of the NGO Promotion of Intercultural Cooperation (PIC) in Odessa, Ukraine. She is Editor-in-Chief at UA: Ukraine Analytica, Ukraine. Hennadiy Maksak is the Chair of the Foreign Policy Council “Ukrainian PRISM”. The editor of the study was New Diplomacy Chair, Jeff Lovitt.